Continuing to apply previous Topps designs to past and present wrestling stars, 2016 Topps WWE Heritage Wrestling celebrates 1986 Topps Baseball with a WWE twist. Each hobby box includes two hits. Things kick off with the 110-card base set that covers top Divas, NXT, Rookies and Superstars, each with the 1986 design. Five parallels add to that with WWE Tag Team Championship Bronze (#/99), Divas Championship Silver (#/50 - Hobby), United States Championship Blue (#/25), Intercontinental Championship Gold (#/10) and WWE World Heavyweight Championship Red (1/1). There are also one-of-one Printing Plates. Offering more depth for set collectors, several inserts are found in 2016 Topps WWE Heritage Wrestling. Each falling one per pack, they include 30 Record Breakers, 30 Turn Back the Clock, and 40 WCW/nWo All-Stars. Dwayne Johnson is also honored with a 10-card The Rock Tribute (1:6 packs) insert that falls across several 2016 Topps WWE releases. Relying on the main design, Autographs (99 per subject) and Dual Autographs feature key names from the WWE. Exclusive to Hobby boxes, Silver parallels are limited to just 50 signed copies. A staple of WWE products, various Divas are celebrated with Diva Kiss (99 per subject) and Autographed versions (25 per subject). Relics close out 2016 Topps WWE Heritage Wrestling in several forms. Swatch Relics (199 per subject) offer event-worn clothing while Survivor Series 2015 Mat Relics (199 per subjects) and WWE NXT UCF Special Mat Relics (199 per subjects) both feature embedded mat pieces from specific events. 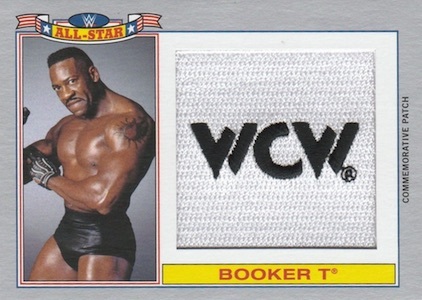 Lastly, Commemorative Patch Cards (299 per subject) display six designs and five wrestlers for each. Options include ECW, NXT, nWo, WCW, WWE, and WWE Legends. 110 cards. Shop for complete base sets on eBay. PARALLEL CARDS: WWE Tag Team Championship Bronze #/99, Divas Championship Silver #/50 (Hobby), United States Championship Blue #/25, Intercontinental Championship Gold #/10, WWE World Heavyweight Championship Red 1/1. 27 cards. Serial numbered #/99. PARALLEL CARDS: Silver #/50 (Hobby). Cards #21-25 (Fat Pack), Cards #26-30 (Value Box). 29 Defeats Undertaker, Ending "The Streak"
PARALLEL CARDS: Bronze #/99, Silver #/50, Blue #/25, Printing Plates 1/1. 20 cards. Serial numbered #/199. 26 cards. Serial numbered #/150. 10 cards. Serial numbered #/199. More like stupid comment. The design is great.